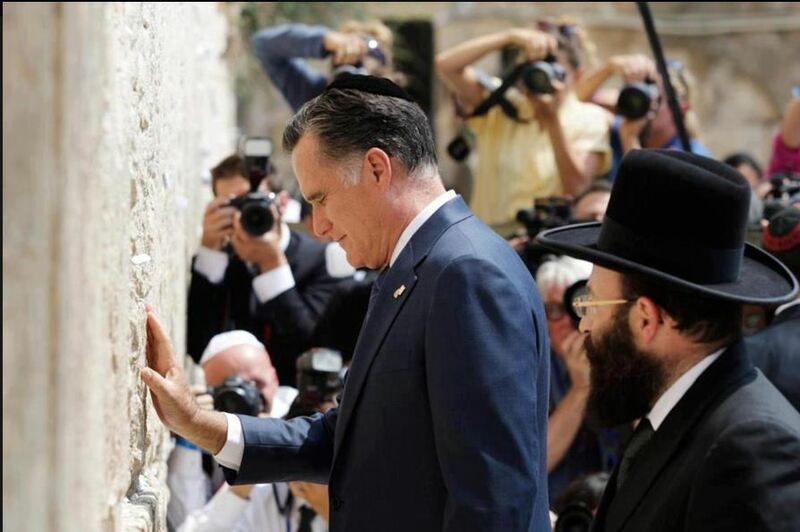 Wile in Jerusalem Mitt Romney made an appearance at the Wailing Wall in a Yarmulka. Was he just trying to pay tribute to Orthodox tradition or does he think he’s Jewish? Perhaps both. Conservative Christianity teaches “supersessionism,” the idea that God’s covenant with Christians replaced his covenant with the Jews and now Christians are the Chosen People, the spiritual heirs of Abraham. Traditionally, Mormonism takes this a step further – teaching that Mormons are not only the spiritual heirs of Abraham, they are his physical descendants as well. Through these blessings, Latter-day Saints are told their lineage from the tribes of Israel. All tribes have been represented, but Latter-day Saints descend mostly from the sons of Joseph—Ephraim and Manasseh. One former Mormon describes the experience: “While reading my patriarchal blessing I took note that it says I was: ‘born through the loins of Ephraim.’ I found it fascinating how patriarchs could tell which tribes people were descended from.” Just as Hindus disagree over the historicity of the Ramayana and orthodox Christians disagree over the literal truth of the Bible, Mormons are of various minds about whether their bloodline is metaphorical or literal. This peculiar-seeming teaching offers a fascinating window into the way that sacred stories emerge and evolve. It also offers a window into one way that religious sects compete and seek status. 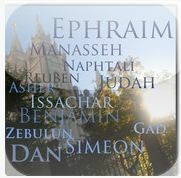 In the Bible story, the Hebrew people are divided into twelve tribes based on the twelve sons of Jacob, one of whom is Joseph of the “Technicolor Dreamcoat.” The story of Jacob’s twelve sons and the twelve tribes of Israel bring together two passions of the Bible writers, both of which played a central role in the development of Mormonism: genealogy and numerology. The concept of Chosen People creates a fixation on blood lines, and the Bible writers often go to great lengths to establish the lineage of powerful men. In fact, two of the New Testament writers, each with a different audience in mind, offered contradictory genealogies of Jesus which theologians have struggled for centuries to reconcile. The Mormon religion continued and expanded the obsession with bloodlines to the point that vaults in Granite Mountain, Utah, now house almost two million rolls of microfilm with genealogical records. Mormonism teaches that family is forever, which is why a man controls his wife’s standing in heaven and members can be baptized on behalf of deceased antecedents, and it is important to know who your ancestors were. The number twelve traces its own lineage of significance clear back to the signs of the zodiac and manifests repeatedly in the Bible. Joseph Smith himself was influenced by Freemasonry, which provided the sacred symbols that appear on Mormon undergarments. It also reinforced a fascination with numerology and biblical numerology in particular. Thus there were twelve signs of the zodiac, twelve months in the year, twelve Tribes of Israel, twelve stones in the pectoral, and twelve oxen supporting the molten sea in the Temple. There were twelve apostles in the new law, and the New Jerusalem has twelve gates, twelve foundations, is twelve thousand furlongs square, and the number of the sealed is twelve times twelve thousand. The triangle is one of the most potent forms in magic, and the 1835 revelation provided numbering of priesthood offices which added to 180 (the number of degrees in a triangle). The revelation specified that in ascending order the deacon’s president presided over twelve deacons, the teacher’s president over twenty four teachers, and the elder’s president over ninety eight elders. . . . There were three men in the first presidency, twelve men in the Quorum of the Twelve Apostles, seventy men in the seventy . . .
Like Christianity, though, the number twelve remains chief among the numbers assigned special powers and significance. We humans are storytellers to the heart, and at the heart of every story is a protagonist, whether an individual or collective, who matters more than the rest. Because of this, two ideas – bloodlines with special rights and numbers with special powers have maintained their appeal for millennia. They can be found all around us –in Harry Potter, for example, or New Age spirituality, or faded tabloids about the British monarchy. Ironically, we frequently fuse our ancient superstitions with modern scholarship methods and technologies. Hence the lack of a 13th floor in many modern hospitals. Hence, too, the microfilm archive in Granite Mountain. Our quest to bend nature’s rules or society’s rules, to stack the odds in our favor, means that we are constantly vying for a little more status. For that reason, it would come as no surprise to a scholar of sacred stories that a preponderance of Mormons are said to descend from the lineage of Joseph. The twelve sons of Jacob and their offspring may comprise the Chosen People according to the biblical chronicle, but not all of the twelve are equally favored by either God or their earthly father. In fact, tales of the Hebrew patriarchs are often stories about paternal favoritism and its consequences, both positive and negative. While reading my patriarchal blessing I took note that it says I was: ‘born through the loins of Ephraim.Within the broader narrative of Chosen People are stories of chosen sons and mothers who compete viciously to ensure their sons receive extra standing or privilege. Father Abraham and Yehovah both favor Isaac over Ishmael, Abraham’s son born of the slave woman, Hagar. Isaac and Yehovah favor his son Jacob over his son Esau. Jacob and Yehovah favor the sons of his wife Rachel over those of her ugly older sister Leah. They favor Joseph most of all, which is why his brothers throw him into a pit and sell him to an Egyptian slave trader where he becomes a confidant of the Pharaoh, ultimately ruling over them all. Among those in the know, announcing that someone is the heir of Joseph is indeed a patriarchal blessing—a pronouncement that he has the most favored bloodline out of the favored twelve. The belief that ancestry matters to God has drawn the LDS Church into several kinds of awkward dogmas. Officially sanctioned racism was prominent in theology and church practice for a century and a half after Smith founded the religion. According to the story, a tribe of Israelites traveled to the Americas around 600BC, but split into two warring factions. The evil faction, the Lamanites, eventually killed off their righteous brethren and were punished with brown skins, becoming the forebears of Native Americans. Offspring of Adam’s son Cain (who murdered his brother) were cursed with even darker skin, became the forebears of Africans. Anyone with African blood was banned from the full privileges of Mormon membership until 1978 and Utah refused to celebrate MLK Day until 2000. Recent DNA research showing Native Americans to have Asian ancestry has caused consternation and even defections among science-minded Mormons. Does Mitt Romney think he is a son of Abraham and that Zion will be his inheritance? It is hard to imagine otherwise. He worships a god that cares who your father was, and his father, and his father before him and who, in part, allocates blessings accordingly. Indeed, Mormon doctrine may offer a little insight into why Romney appears so untroubled by an America where fortunes increasingly are dictated by heredity. * Note: The LDS Church, the dominant denomination of the Mormon religion, does not condone polygamy or plural marriage where it is forbidden by law. However, it is assumed that some men will have multiple wives in heaven. In the U.S., the practice is retained only by fundamentalist sects that are independent of the LDS denomination. ExChristian.Net: Does Mitt Romney Think He's a Jew?